About 2 years ago, give or take a week or two, I decided to start making my own laundry soap. I was looking for a healthier product without all the harsh chemicals. It needed to be gentle on skin, kind to our septic tank ecosystem, easy on our wallets and . . . It had to clean our clothes! Simple, Safe, Effective, Multi-use cleaning supplies. Finely grate one 14 ounce bar of ZOTE. This will equal 4 cups of grated soap. To every 14 oz. bar of grated ZOTE add 2 cups of Borax and 2 cups of Washing Soda; mix well to blend thoroughly. Add 2 tablespoons of Laundry Soap and 1/4 cup of Baking Soda to your wash water allowing it to disolve, BEFORE adding dirty laundry. Laundry Soap will not suds. This in no way decreases its effectiveness. Flip-top laundry soap bucket is a recycled dishwasher tablet container. I wrote my recipe out on a 4-inch x 6-inch card, ran a little decorative colored marker around the edges and secured card with 3 strips of clear packing tape to keep ink waterproof and readable. When my supply gets down I don't have to go looking for my recipe. It's right where I need it! This is also a great way to get others excited about making their own cleaning products without being pushy about it. I keep my laundry soap in plain sight on top of my dryer for easy access and to showcase my homemade product. 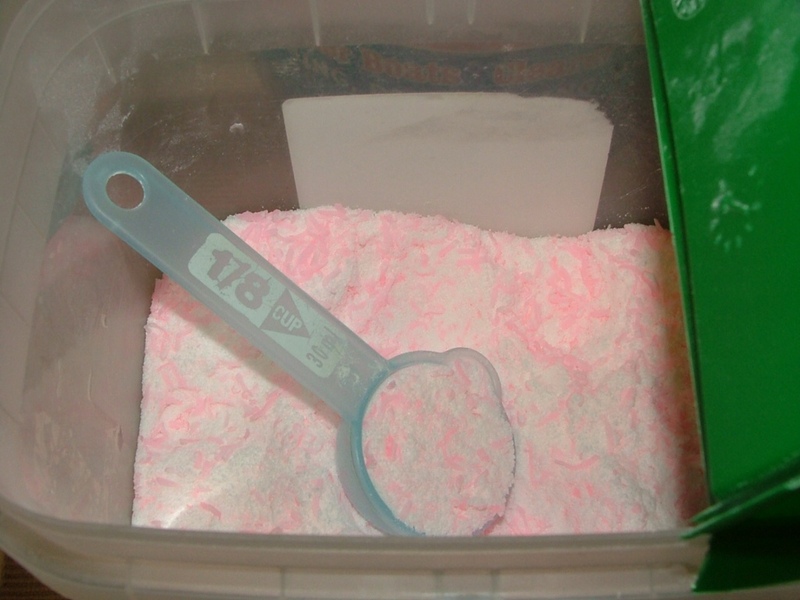 I keep a handy 2-tablespoon scoop in my Laundry Soap container. I also keep a 1/4-cup scoop in my baking soda bucket. I buy Arm and Hammer Baking Soda in 13.5 pound bag for $5.98 at Sam's club and store it in a plastic baking soda bucket. Baking soda regulates the pH level in your wash water causing it to be neither to acidic or alkaline this helps kill odor-causing bacteria and helps loosen soil. 20 Mule Team Borax $3.38 4# 7oz. 4.4 cents per oz. Super Washing Soda $3.24 3# 7oz. 5.9 cents per oz. 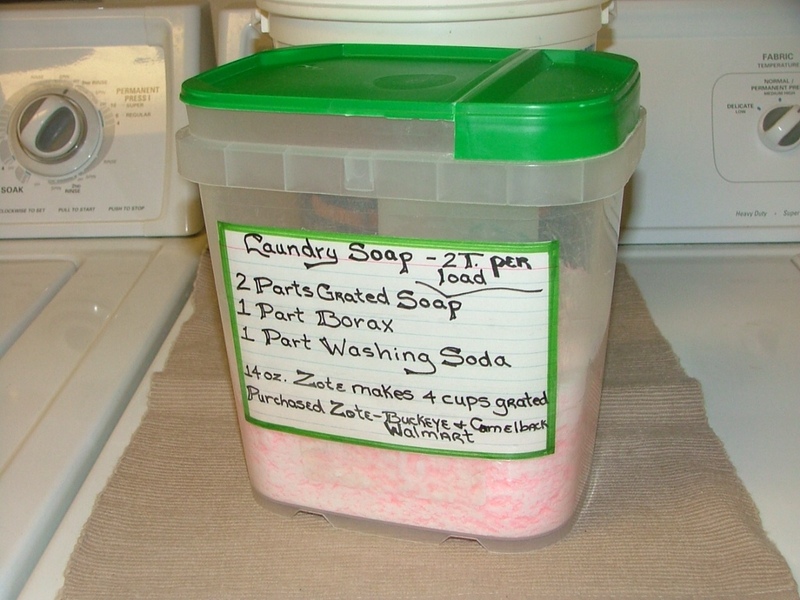 Cost per load with my homemade Laundry Soap plus Baking Soda is 12 cents per load. Cost for Tide powdered detergent is 22 cents per load. As you can see my costs have been cut in half by making my own laundry soap. 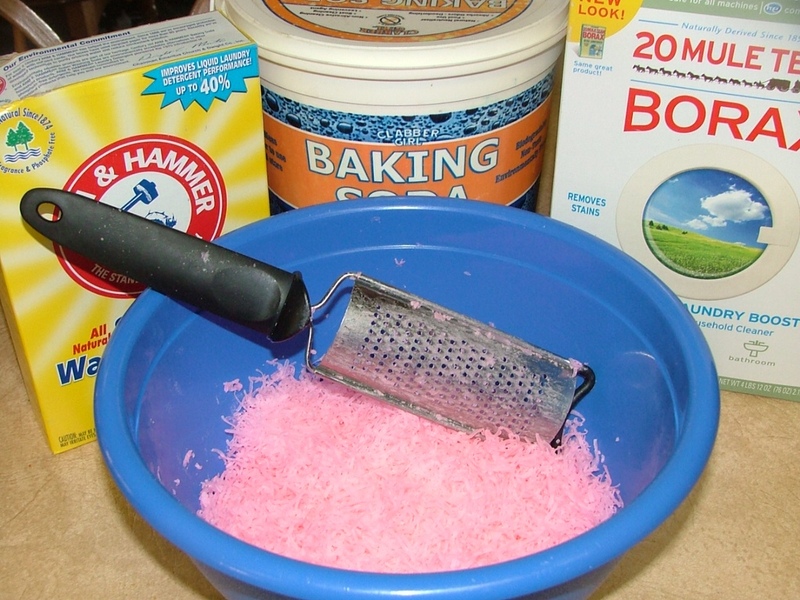 While saving money is important, especially with the cost of everything rising, the main reason I take the time to make my own laundry soap is because I am washing my clothing with gentle but effective soap and not with a harsh detergent laden with chemicals, lab produced fragrance and dyes. This laundry soap is gentle enough for your delicates, baby clothes, and dirty blue jeans! And, it's what we're using . . . Over at Julie's!!! Is it ok to add salt to it? and since it's got the brightener in it , I wouldn't have to add the Sun brand that brightens the whites? Truthfully, I've never tried salt to whiten . . . I use Fels Naptha when my wash is super dirty and a bit ripe, and I soak my dingy whites in Sun Oxygen Cleaner, purchased cheap from Walmart. The Zote has added whiteners in it so I don't have to pre-soak my whites that often. I 'm going to make your recipe today if I get my washing soda in mail today. 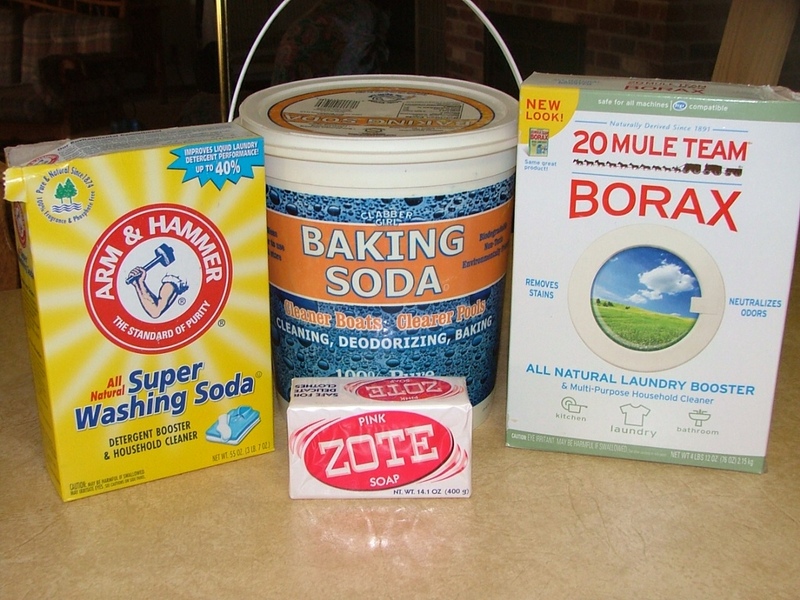 Walmart carries washing soda, it's right by the 20 Mule-team Borax. Hope you're in a safe place with the storms coming! Have fun making your laundry soap! Pecan Sandies ~ Get an Upgrade!